Scientists from the National Center for Scientific Research Demokritos in Athens, Greece have discovered that using materials filled with tiny holes can lead to the improvement of thermoelectrics as a viable alternative for harvesting wasted heat. 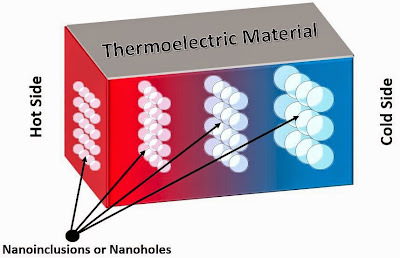 Porous materials (materials filled with holes) have a direct correlation to thermal conductivity. The more porous a material is, the lower the thermal conductivity. This results in a better thermoelectric material since there is lower heat dissipation/loss. The also researchers found that the smaller the pores and the closer they're packed together, the lower the thermal conductivity. They also show that, in principle, micro-nano porous materials can be several times better at converting heat to electricity than if the material had no pores. From your hot car to your warm laptop, every machine and device in your life wastes a lot of energy through the loss of heat. But thermoelectric devices, which convert heat to electricity and vice versa, can harness that wasted heat, and possibly provide the green tech energy efficiency that's needed for a sustainable future. Now, a new study shows how porous substances can act as thermoelectric materials—pointing the way for engineering the use of such materials in thermoelectric devices of the future. About 70 percent of all the energy generated in the world is wasted as heat, said Dimitris Niarchos of the National Center for Scientific Research Demokritos in Athens, Greece. He and Roland Tarkhanyan, also of NCSR Demokritos, have published their analysis in the journal APL Materials, from AIP Publishing. To create the technology needed to capture this heat, researchers around the world have been trying to engineer more efficient thermoelectric materials. One promising material is one that's filled with tiny holes that range in size from about a micron (10-6 meters) to about a nanometer (10-9 meters). "Porous thermoelectrics can play a significant role in improving thermoelectrics as a viable alternative for harvesting wasted heat," Niarchos said. Heat travels through a material via phonons, quantized units of vibration that act as heat-carrying particles. When a phonon runs into a hole, it scatters and loses energy. Phonons thus can't carry heat across a porous material as efficiently, giving the material a low thermal conductivity, which turns out to increase the efficiency of heat-to-electricity conversion. The more porous the material, the lower the thermal conductivity, and the better it is as a thermoelectric material. So far, however, researchers have yet to systematically model how porous materials maintain low thermal conductivity, Niarchos said. So he and Tarkhanyan studied the thermal properties of four simple model structures of micro-nano porous materials. This analysis, Niarchos says, provides a rough blueprint for how to design such materials for thermoelectric devices. Overall, the researchers found that the smaller the pores and the closer they're packed together, the lower the thermal conductivity. Their calculations match data from other experiments well, Niarchos said. They also show that, in principle, micro-nano porous materials can be several times better at converting heat to electricity than if the material had no pores. The first model describes a material filled with holes of random sizes, ranging from microns to nanometers in diameter. The second is one with multiple layers in which each layer contains pores of different size scales, which gives it a different porosity. The third is a material that's composed of a three-dimensional cubic lattice of identical holes. The fourth is another multilayered system. But in this case, each layer contains a cubic lattice of identical holes. The size of the holes is different in each layer. According to the analysis, the first and fourth models have lower thermal conductivities than the second. The third model seems to be the best one, as it also has a lower thermal conductivity than the fourth model. Except for the first model, however, all the models aren't practical because they represent idealized situations with a perfect arrangement of pores, Niarchos said. It's also practically impossible to create precisely equal-sized pores. The first model is thus the most realistic. Still, he said, all the distinct models demonstrate the importance of porosity in thermoelectric materials. Built upon simple and general analytical formulas, the models allow for a very fast and accurate computation of the effective lattice thermal conductivity of a porous material and the systematic analysis of such materials.